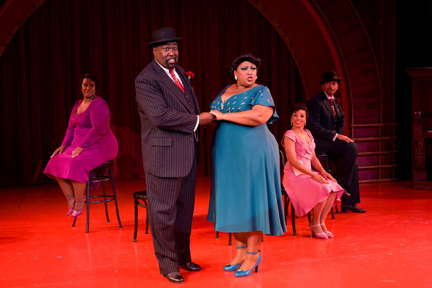 The cast of Eugene Barry-Hill, Doug Eskew, Kecia Lewis-Evans, Cynthia Thomas and Debra Walton, all of whom have previously appeared in productions of Ain’t Misbehavin', sings up more than 30 Thomas "Fats" Waller tunes in a setting reminiscent of 1930s jazz clubs (John Lee Beatty, set design). Wearing sparkling flowy dresses and dapper suits (Gail Baldoni, costume design), they have the audience clapping, and sometimes singing along, with classics like "This Joint is Jumpin'," "Your Feets Too Big," Honeysuckle Rose," "Fat and Greasy" and the title song. The group is accompanied by a band behind the action on stage and a piano player on the set. Faria's choreography is fun and just the right touch. There's everything from a waltz to tap (Barry-Hill is particularly skilled). There's a lot of humor and there is a nice variety of song styles and tempos. Pat Collins' lighting design creates shadows, lighting effects and even a shower reflections off of a jeweled disco ball to enhance the production. Nada. A fun evening, especially if you like Fats Waller. The show runs through Nov. 20 at Long Wharf Theatre, New Haven. Tickets range from $40-70 and can be purchased at 203-787-4282 or at www.longwharf.org.